Isaac Bonewits is one of North Americas leading experts on ancient and modern Druidism, Witchcraft, magic and the occult, and the rapidly growing Earth Religions movement. A practicing Neopagan priest, scholar, teacher, bard, and polytheologian for over thirtyfive years, he has coined much of the vocabulary and articulated many of the issues that have shaped the rapidly growing Neopagan movement in the United States and Canada, with opinions both playful and controversial. He is the author of Real Magic, Authentic Thaumaturgy, The Pagan Man, Bonewits's Essential Guide to Witchcraft and Wicca (formerly Witchcraft: A Concise Guide), and Bonewits's Essential Guide to Druidism, Neopagan Rites (formerly Rites of Worship), and (with his wife Phaedra) Real Energy (New Page March 2007) as well as numerous articles, reviews and essays. He is a singer-songwriter with two-and-a-half albums to his credit. As a spellbinding speaker, he has educated, enlightened and entertained two generations of modern Goddess worshippers, nature mystics, and followers of other minority belief systems, and has explained these movements to journalists, law enforcement officers, college students, and academic researchers. He is the Founder and an Archdruid Emeritus of Ár nDraíocht Féin: A Druid Fellowship, (the best known Neopagan Druid organization based in North America), a 3° Druid within the United Ancient Order of Druids (the best known Mesopagan Druid order), a retired High Priest in both the Gardnerian (British Orthodox) and the N.R.O.O.G.D. (California Heterodox) traditions of Wicca (Neopagan Witchcraft), an initiate of Santeria (Afro-Cuban Mesopaganism) and the Caliphate Line of the Ordo Templi Orientis (Aleister Crowleys Mesopagan magical tradition), as well as a member of other Neopagan and Mesopagan Druid orders. He has been a member of the Covenant of Unitarian Universalist Pagans (CUUPS) for several years. 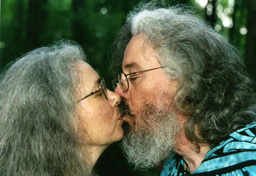 Having survived four previous spouses (and vice versa), on July 23, 2004 he was handfasted to former CUUPS Vice President, tarot expert, writer, and Wiccan Priestess, Phaedra Bonewits (hope springs eternal). With her he has co-authored a book called Real Energy: Systems, Spirits, and Substances to Heal, Change, and Grow.